Photo credit: TimDan2 on FlickrAkrisios, king of Argos, had a daughter of surpassing beauty, but no son. At last he sent a messenger to the oracle at Delphi to ask what hope he had for an heir. The oracle’s reply was grim: Akrisios would have no son, and his grandson would kill him. In the world of Greek mythology, Fate was an implacable force which the gods themselves could not escape. That didn’t stop people from trying. Often, their efforts caused the fate they feared. So the king imprisoned his daughter, Danae, in a bronze chamber buried beneath the palace courtyard. Servants fed and cared for her, but she never saw the light of day. How many daughters have felt walled in by a father’s fears? Walls, however, could not bar Zeus, the promiscuous father of the gods. Smitten by her beauty, he descended in the guise of golden rain, a splash of sunlight in her dreary cell. Small wonder the lonely girl succumbed to his advances. But Zeus nipped out as soon as he’d had his way with her, since the one thing he feared was Hera’s fury when she caught him cheating. Lonely once more, Danae gave birth to Perseus nine months later. Her nurse helped hide the boy for a few years, but eventually his gleeful shouts ringing up through the courtyard gave them away. Akrisios dragged his daughter before the altar of Zeus and commanded that she confess the father’s name. Her answer sounded like blasphemy. Enraged, the father bound his daughter and grandson in a chest and commanded it to be tossed into the sea. Fate had other plans. Diktys, a kindly fisherman on the island of Seriphos, was astonished at the day’s catch when he opened the chest snagged in his net. He took in Danae and Perseus out of pity, and perhaps also because of the girl’s great beauty. Perseus became his foster-son. Perseus’ first assignment was meant to be his last. The king demanded the head of Medousa, one of the three Gorgon sisters, powerful monsters who were no more human than giants and had snakes for hair. In despair, Perseus went down to the beach:cite: and prayed. He had not the foggiest idea how to achieve his quest, nor even where to begin. Bastards of Zeus often receive divine aid — after all, they’re related to half the pantheon. Perseus was lucky; both Hermes and Athena came by to help and advise. His quest would require a scavenger hunt of sorts, Hermes explained. Gorgon-beheading was serious business, and a hero needed the right tools for the job. The right tools in this case were winged sandals, Hades’ cap of invisibility, and a magical bag called the kibisis that would allow Perseus to carry the Gorgon’s head safely. Luckily, Hades, god of the underworld, had left his cap in the charge of a trio of nymphs who guarded the other two items as well. There was just one problem: Hermes and Athena didn’t know where the Nymphai lived. However, Athena said, the Graiai did. She would lead the way. The aged Graiai were another trio of magical sisters. They had only one eye and one tooth between them. The old tales skip Perseus’ route to the Graiai’s homeland, and pick up with the hero hiding behind a boulder, watching for the right moment to spring out and grab both tooth and eye. Hermes’ gift of thieves and tough negotiators was with him. He snatched the loose body parts just as one sister was passing them to another. As kin to the Gorgons, the Graiai hated to answer his questions, but he left them no choice. Again, tales of Perseus’ adventures stint on geography, partly because the only surviving accounts of this myth are summaries of long-lost works and plays. But we know he found the Nymphs with the aid of the Graiai’s directions, and these three ladies gladly handed over their treasures. Perhaps they admired his perseverance. Or perhaps they knew his Fate. He donned the cap and the magic shoes, making himself an instant icon for later Greek art, and allowing him to skim over the waves behind his two patron gods. After a long and treacherous journey to the rim of the world, they at last found the place where the Gorgons dwelt on the shore of the outer encircling Ocean. Athena the tactician then warned Perseus to avert his eyes when he struck lest he be frozen by Medousa’s dreadful gaze. In some versions of the tale, Athena held a polished shield for Perseus to use as a mirror. Cloaked by his cap, Perseus waited for the Gorgons to fall asleep, then swooped down to behead Medousa. A strange and terrible creature she was, with bulging eyes and a gargoyle-like face that would win a staredown contest with a jack-o-lantern. In the odd way of old myths, two creatures sprang from her blood and her severed neck: a giant of a man named Chrysaor, and Pegasus the winged horse. Perseus, however, did not have time to stop and gawk at her unlikely offspring. Medousa’s sisters awoke and pursued him. He fled them on the winds and flew back the way he had come. On his way home, he spotted a beautiful maiden chained to a rock by the sea. Swooping down, Perseus learned from Andromeda that she was being offered as a sacrifice by her father Kepheus to appease a dreadful ketos, a sea-monster, sent by Poseidon to ravage the land after her mother Kassiepeia rashly boasted that she bested the Nereids in beauty. Ever the negotiator, Perseus convinced Andromeda and/or her father to let him marry her if he saved her. 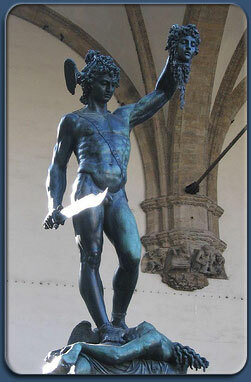 This time Perseus used a more heroic approach, battling with the monster at the edge of the waves. Ketos, Andromeda, Perseus, Kepheus, and the M-shaped figure of Kassiepeia were later memorialized in a group portrait of constellations in the night sky. Before Perseus could live happily ever after, he still had to free his mother from the wicked king. Andromeda accompanied him back to Seriphos, where he was reunited with his mother and foster-father. They were overjoyed at his return and good fortune. Polydektes, of course, was not, and sent for the youth at once. Perseus came before the king holding a drab bag under his arm. Evidently, the deadly properties of the Gorgon’s gaze were not well-known in those days, because Polydektes demanded proof of mission accomplished. “Let me see it!” he ordered. It was the last command the king gave, and the last order of Polkydektys that Perseus obeyed. With Polydektes out of the way, Perseus’ questing days were over, and he settled down to enjoy his newly-wedded bliss with Andromeda. Athena took charge of the Gorgon’s head, for it was too dangerous for mortals to handle. She placed it on her breastplate as a formidable weapon. And Akrisios? Years later Perseus went looking for his grandfather. The old man felt remorse for his deeds, and was overjoyed to learn his daughter and grandson were alive. Akrisios decided to throw a great festival complete with athletic competitions to celebrate. During the discus throw, Perseus inadvertently struck him dead with a bad cast: the discus in ancient times was made of stone. Appalled by his blood-guilt, Perseus refused the throne of Argos and gave it instead to his cousin Megapenthes, king of Tiryns. An odd quirk of this story is that Megapenthes exchanged his own kingdom of Tiryns for Argos; perhaps this is some legendary hint of a historical event. Later Perseus would strike out from Tiryns and found a new city on a well-fortified crag just a day’s journey to the north: golden Mykenai, future home of the great king Agammemnon, who would lead another generation of heroes to Troy.